The collapse of the World Trade Center buildings on September 11, 2001 posed questions on the stability of tall buildings in fire. Understanding the collapse of the WTC Towers offers the opportunity to learn useful engineering lessons in order to improve the design of future tall buildings against fire induced collapse. 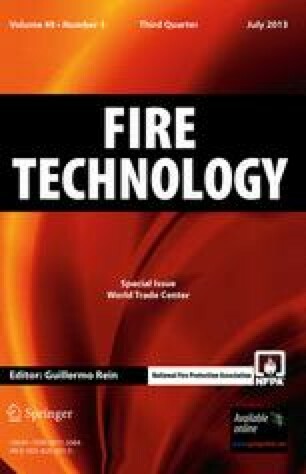 This paper extends previous research on the modelling of the collapse of the WTC Towers on September 11, 2001 using a newly developed “structures in fire” simulation capability in the open source software framework OpenSees. The simulations carried out are validated by comparisons with previous work and against the findings from the NIST investigation, albeit not in the forensic sense. The column “pull in” that triggers the instability of the structure and leads to collapse is explained. The collapse mechanisms of generic composite tall buildings are also examined. This is achieved through carrying out a detailed parametric study varying the relative stiffness of the column and the floors. The two main mechanisms identified in previous research (weak and strong floor) are reproduced and criteria are established on their occurrence. The analyses performed revealed that the collapse mechanism type depended on the bending stiffness ratio and the number of floors subjected to fire and that the most probable type of failure is the strong floor collapse. The knowledge of these mechanisms is of practical use if stakeholders wish to extend the tenability of a tall building structure in a major fire. Authors are grateful to Professor Jose Torero for helpful comments and advice on the draft of this paper and also acknowledge the assistance provided by the OpenSees team at PEER, UC Berkeley. Lamster M (2011) Castles in the air. Sci Am (special issue) doi: 10.1038/scientificamerican0911-76. (2011) Opensees Software, University of California, Berkeley, http://opensees.berkeley.edu/index.php.Accessed 11 September 2011.